This helpful guide makes it easy to choose the perfect backsplash tile for your kitchen and bath. Select one of our backsplash designs to learn which backsplash tiles and trim pieces are used, and more about each of the materials. Protect the walls in your kitchen and baths with one of these creative tile combinations to add color, character, and personality to your space. Combining chocolate, toffee, and beige glass tiles together with natural Emperador Dark Marble creates a stunning kitchen backsplash design. The light-reflecting glass tiles and the elongated pattern give the traditional marble a decidedly contemporary edge. 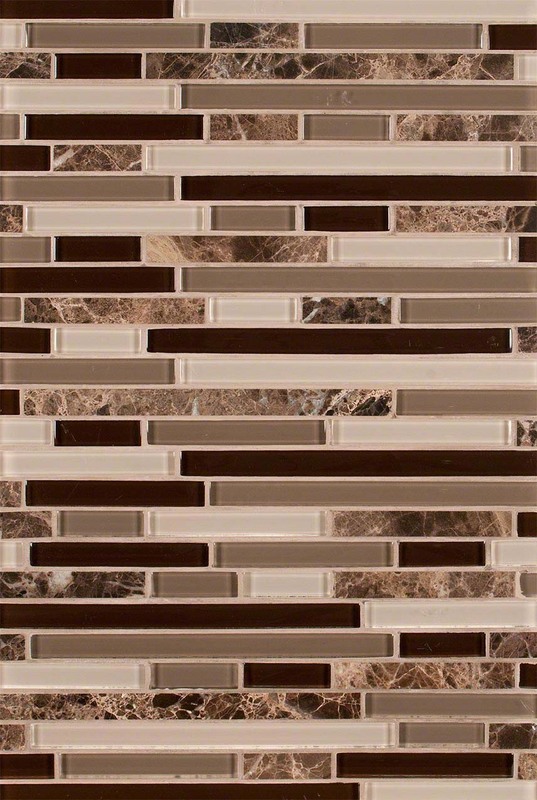 This backsplash design would partner well with darker cabinetry that would highlight the differences in hues of each piece of the pattern.